The origin of ART Vannes was in the village of Vannes-le-Chantel located in the eastern region of France (precisely, Lorraine County). History traces its roots to about 1765 under aristocratic patronage. Fast forward to 1960, where over 600 glassmakers resided in the region, whose production included lead-based artistic pieces formed in moulds bought from defunct makers. Today, Europe`s largest glassmaking school (CERFAV) is located in the region. 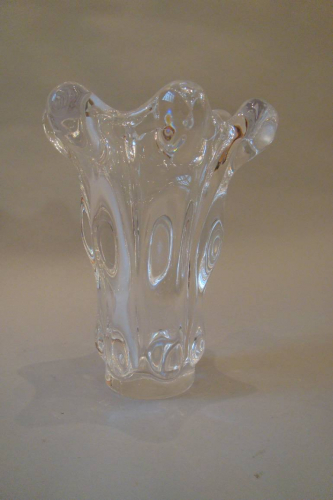 Additionally, several French crystal companies (Baccarat, Daum, and Portieux) are located in the area. It was in about 1970 that ART Vannes discontinued production, and Cristal de Sevres was born. Later, they produced under the brand of Daum. Because the ART Vannes FRANCE furnaces were in operation only from 1950 to 1970, these gorgeous pieces are considered quite a special find.